Before my son was one year old, we had him assessed by a naturopathic doctor. Among that doctor’s many recommendations was the suggestion to give him castor oil tummy massages. Although it sounded like an odd suggestion to me at the time, I was desperate to relieve his discomfort, and I decided to try it. Our naturopath told me that one of the many benefits of castor oil tummy massages is assisting with the body’s detoxification process. Castor oil contains high amounts of the fatty acid, ricinoleic acid, which is very antimicrobial. As it is absorbed through the skin, it also penetrates the body’s organs, such as the liver. Since the liver is one of the biggest detoxification organs of the body, castor oil assists in detoxification by pulling toxins out of the body and increasing blood circulation to the entire area to which it is applied. Another way that castor oil assists with the body’s detoxification is through the lymphatic system. When castor oil is absorbed through the skin, it not only permeates the body’s organs but it is also infiltrates the lymph circulation. As it is absorbed into the lymph fluid, it improves immune function by eliminating wastes and toxins and decreasing inflammation. Castor oil also assists with the body’s gastrointestinal functions. Although castor oil is a well-known old-fashioned laxative, it does not have a laxative effect when used topically. However, a castor oil tummy massage helps to soothe a little tummy by providing relief from bloating, gas, and constipation. When I rub my little guy’s tummy, I can actually feel my hand gently pushing the gas bubbles along his gastrointestinal tract. By the end of the massage, he often passes the gas (or stool) that has been bothering him. 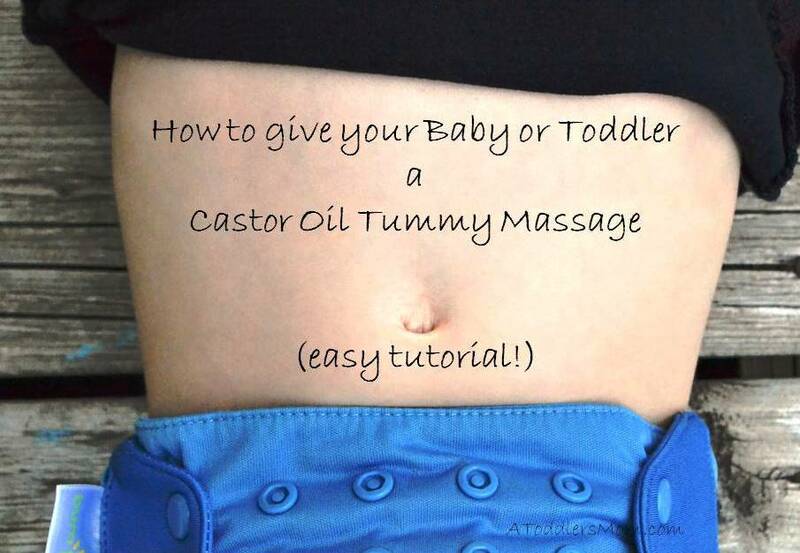 For me, the biggest surprise of giving castor oil tummy massages to my son is how relaxing they are for him. When I first started massaging his tummy, he was just a little baby who was always crying, fidgeting, and moving around. From the very first castor oil tummy massage that I gave him, he was quiet and he was still during the massage. For just a couple of minutes, he was a different baby. He loved the castor oil tummy massage, and he began to ask for it often by rolling onto his back and rubbing his tummy with his hands. It quickly became part of our bedtime routine. Although he is now a very loud and active toddler, he still loves his tummy massage enough to lie motionless and silent during it. Because he loved the tummy massages so much, I also started giving myself castor oil tummy massages at the same time. I couldn’t believe how relaxing they were! I also felt more refreshed and energized the next morning. Since castor oil can stain clothing, put an old t-shirt on your little one and lay him on an old towel. Apply a small amount of castor oil to your hand and warm the oil between your hands. 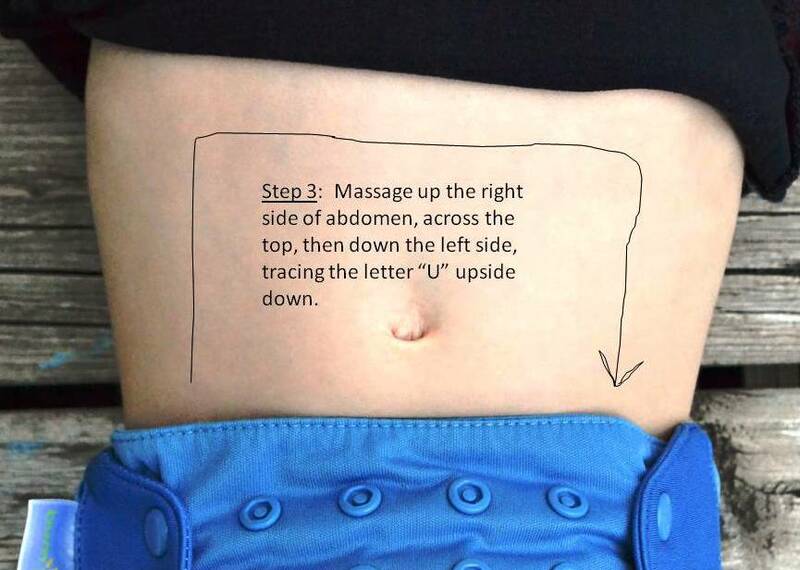 Rub your child’s abdomen in the “I Love you” pattern for several times as demonstrated in the photos below. Be sure to spend extra time massaging over the liver (just below the right rib cage) to assist with detoxification. Pull t-shirt over abdomen. Let oil soak in overnight. As for myself, I rub my stomach for 5-10 minutes in the “I love you” pattern. To push the oil deeper into the skin, I also apply a warm compress for 20-40 minutes. Please note: Use of castor oil is contraindicated during menustration or pregnancy. Please remember that the information provided in this post is for information purposes only. Always remember to do your own research and to talk to your health care provider before starting any new therapy to see if it is right for you and your child. Love how practical this is!! !